'The Royal Wedding - The Official Album' is a unique memento of the most significant and anticipated event in Britain's modern history. 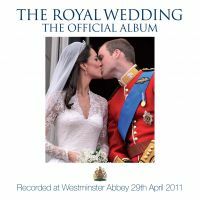 Featuring every aspect of this incredible occasion, the album includes the music - old and new - the readings and blessings, and of course the exchange of vows between Prince William and Catherine Middleton - as they happen (real time) in the historic Abbey on the day itself. It is the only official, sanctioned recording of The Royal Wedding. The music is provided by The Choir of Westminster Abbey, the London Chamber Orchestra, the State Trumpeters and the Trumpeters of the Central Band of the RAF. Click here to buy 'The Royal Wedding - The Official Album'.